This week we’re excited to release one of our most requested features – Reader Commenting. Before,wiki users with ‘Reader’ access were only allowed to view your wiki. Now, you can enable Readers to leave comments. The ability for readers to leave comments is great if you like to get input from everyone in your organization, but you don’t want to give them full access to edit other pages on your wiki. Reader comments are also useful for classrooms. Teachers can post questions on a page and have students answer them without having the ability to edit the questions. 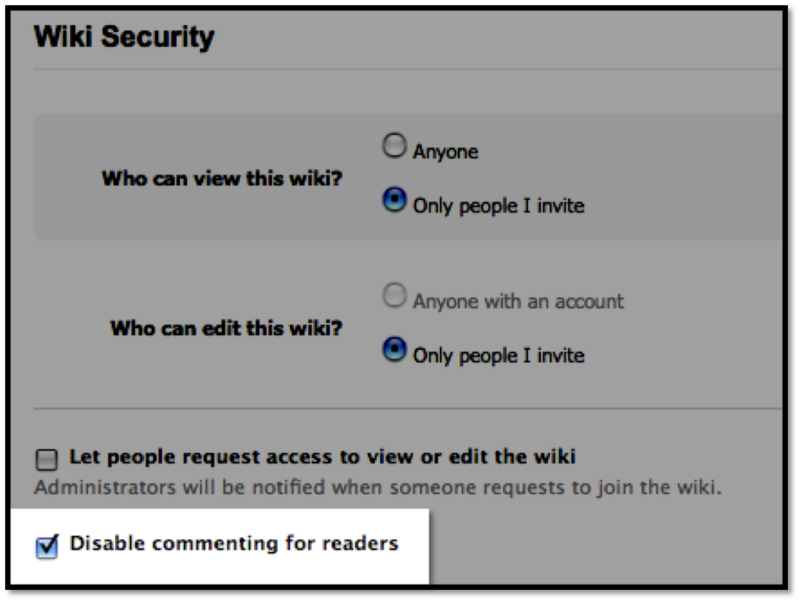 If you already have a wiki, you’ll need to enable this feature by doing this: Go to Settings —> Wiki Security —> Uncheck the ‘Disable reader commenting’ box. New wikis will have Reader Commenting enabled by default. How are you going to use reader commenting? Tell us in the comments! Hi, I would really like a way to save a page that I am editing without having to scroll down to hit the “save” button. There is one way to save a page without scrolling to the bottom. Use our keyboard shortcuts. Press CONTROL + S and your page will save (Command + s on a mac). Is there a way where the public can post comments to a wiki without having to invite them? One way I will use reader comments is to direct readers (by an email message) to a page with a question I would like answered and have them post their answer as comments, similar to what you have done here. Is there a way to change the comment order with the free basic wiki? Reordering comments is part of the customization feature, which is a premium feature. You can check out the pricing plans and packages by clicking the “Upgrade!” link on your wiki. Great news! I am starting to be a wiki and it’s nice to know that readers can put comments now. In this way, everyone will come up with having better a better page.